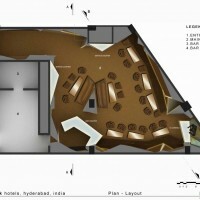 Khosla Associates have designed the Carbon Bay in Hyderabad, India. The Park Hotel’s latest property in Hyderabad, has a central theme of a contemporary palace and several designers from across the world were commissioned to design its varied spaces using the erstwhile Nizam of Hyderabad’s jewels as inspiration. 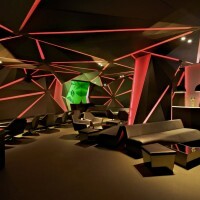 Khosla Associates were commissioned to design the Hotel’s bar “Carbon”. faceted structure that boldly references the multiple facets of a black diamond; the idea is abstracted by creating a dramatic faceted labyrinth that dynamically and unpredictably envelopes the entire space. Seating moulds into walls and then onto the ceiling. The color palette is deliberately stark. Monotones of copper and dark champagne are offset with certain facets in bronzed mirror. aesthetic of the outer shell. 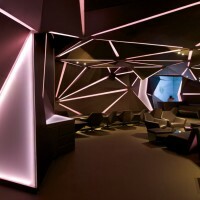 Sharp edges of the faceted walls are softened by the luxury of padded fabric. moulded on the edged of all the facets. 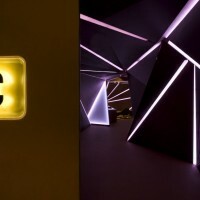 The pre-programmable led light has the ability to change colour altering the mood of the space. 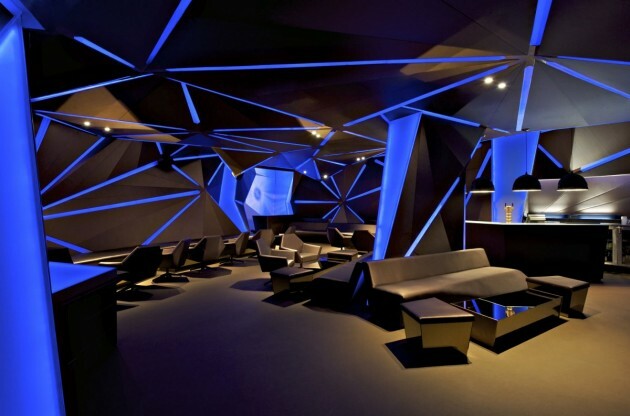 Prisms like projections are played on the triangulated wall behind the dj counter. 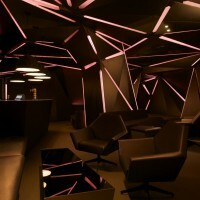 The flooring is seamless, a bronze vinyl, and the ceiling reflects the same faceted shapes as the walls. 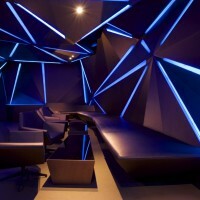 The intent was to evoke the feeling of bieng inside the heart of a diamond. 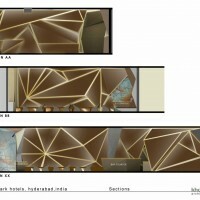 The concept thus interprets the central theme of the hotel and the design brief the Nizam of Hyderabad’s jewels in a completely abstract and futuristic way. Design Team : Sandeep Khosla, Amaresh Anand and Dhaval S.